Let me recap Thursday for you. Our warranty company was supposed to send someone out to fix our dishwasher. 'Oops, we brought the wrong part with us, we will try again tomorrow.' Thank you, I love the pile of dirty dishes that is mounding on the counter. (Ok that is my fault, I'm just too lazy to wash them by hand!) Thursday evening the guy that did the cabinets in my mom's kitchen came and measured and discussed what we could do in there. We are going to compare Home Depot's price to his price. 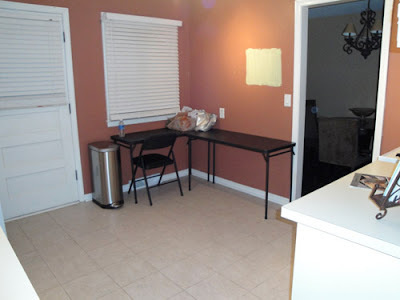 Next I make dinner, we eat, I start cleaning up, Chris is studying, Kyle starts changing a few outlets out for us. Thankfully Kyle was in and out of the basement on Thursday night, or we might not have known that water was pouring into our basement. The garbage disposal had backed up and asparagus chunks ended up in my shower. On Friday morning I called the warranty company to check and see if the dishwasher guy could come, and ask them if our plumbing/disposal is covered in the warranty. Thankfully it was, and a guy came out to fix the problem. Turns out one of our pipes was split the entire length, and someone decided glue was a great remedy for that. He unclogged our pipes and replaced the broken one for our service charge of $60, and told us it would have normally cost $600. Thank God for the warranty company! Lastly the guy came out to fix the dishwasher. Apparently the motor was in two pieces. I suppose that makes it difficult for the dishwasher to actually work. But the nice man fixed it and now it works wonderfully! As much as I was irritated that it didn't get fixed before we moved in, I am happy to report that in the process of fixing the dishwasher we learned that our kitchen also has hardwood floors! They are hidden under two layers of sticky vinyl, so who knows what shape they are in. It would be just our luck that there is termite damage under there as well. I am using all my will power to resist the urge to try and peel off all the vinyl right now! There is water dripping into my basement and food in my shower. Thank you garbage disposal. Let me tell you, home ownership is so much fun! Ha. Right. On a positive note we did get about five outlets and outlet covers switched from almond to white tonight. Thanks Kyle! Now I'll just sit and wait and hope our warranty company comes out and fixes my leaky pipe. We ate our first home-cooked meal in our new house today. It was nice to finally cook again. I may not be a gourmet cook, but there is definitely something nice about eating a meal I cooked versus something from a restaurant. The meal was rather simple, and looks a bit sparse, but it did the trick! 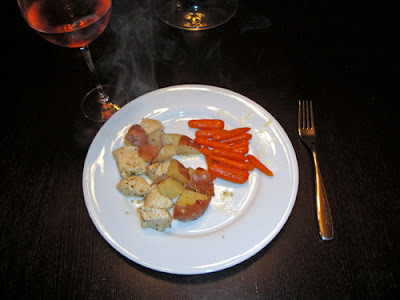 I found the recipe for the chicken and potatoes here, and the carrots involve about 3 tablespoons of orange juice, a tablespoon or so of butter, some honey and some brown sugar. Just cook them until the carrots are tender to your liking! We also put the first nail in our wall. Ok actually Chris hung some drapery panels last night, but this is the first picture we hung up. It is the only thing that I actually know where I want it to go. Hopefully we get some more stuff up on our walls soon. has turned into just three! 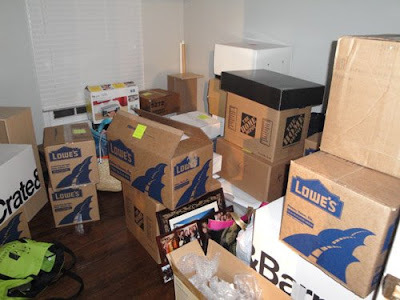 I did a lot of unpacking and managed to empty all of the boxes in the kitchen and most of the boxes in the extra bedroom. 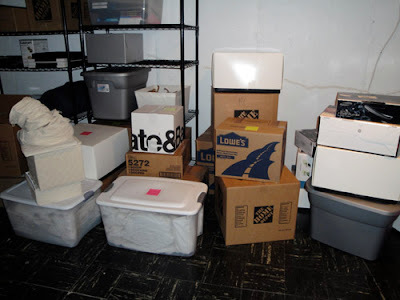 Ok so in reality several of the boxes ended up in the basement in our storage area, but they mostly consist of serving dishes and extra dishes and glasses that I don't want to unpack if we are just going to be tearing out the kitchen cabinets in a few weeks. 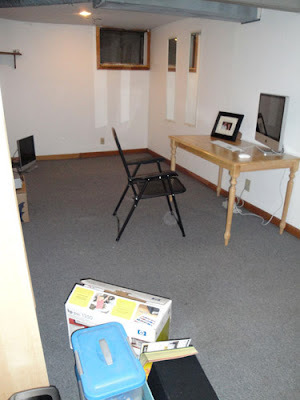 Today I also put together my desk in my basement workroom. I definitely need to come up with something to make this room a little bit more put together. 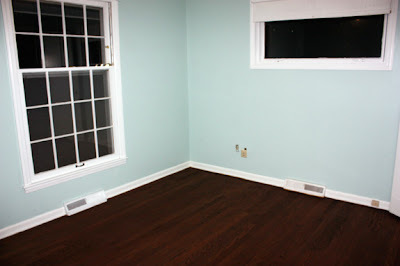 The trim will get painted white, and I will probably paint the walls green, but I'm not sure what to do about the floor. Right now it is some sort of hideous gray horrible carpet. I am looking for a cheap remedy that looks better than what is there now. 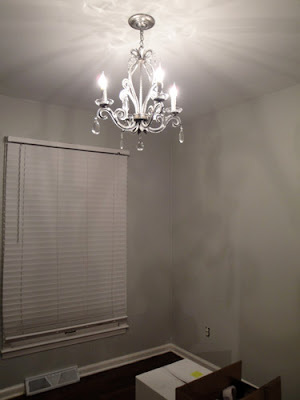 Chris and I installed a new light fixture in the extra bedroom, and we did it without anyone else's help! Ok I know installing light fixtures isn't rocket science, but we hadn't actually put up one by ourselves yet, so I am happy to report that we can. We also went to Home Depot tonight to place an order for Silestone countertops. Even though there are no concrete plans for the kitchen yet, I wanted to take advantage of the current specials that allowed us to get 20% off. The kitchen designer told us we could place an order based on a layout we wanted in the kitchen to get that price point, and still have the ability to cancel or change our order later. The color we chose is called Ivory Coast. I think it will look great with white cabinets and green walls! 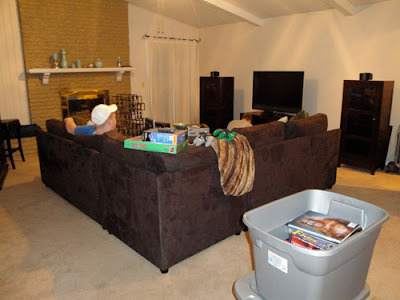 All of our furniture and things made it safely to our house today. It is really strange that we will be sleeping here tonight! I wish I would have taken some pictures of the actual moving process, but I wasn't thinking about that at the time. Actually I should have taken a picture the truck as our stuff was being put in. The truck was filled wall to wall floor to ceiling absolutely perfectly. I believe the guy that packed the truck should be referred to as the puzzle master. Or packing master, whichever you prefer. We have gotten so much accomplished in the last couple of days. Yesterday when I got home from work, Chris, my mom and Anita (my mother in law) were at the house working. Chris installed all of the new door knobs, my mom painted the insides of all of the hallway closets and the front door, and Anita cleaned the whole house so it was ready for our stuff. 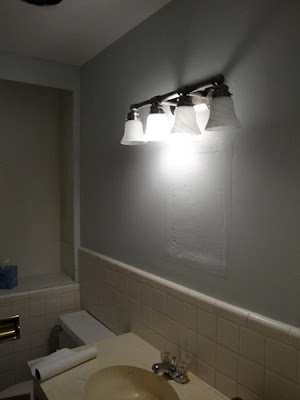 Then today after we had all of the stuff moved over, Chris and Kyle installed the new bathroom light fixtures. Things are starting to look pretty good! And here is what I have to look forward to in the next week or so... trying to figure out where to put all the stuff in these boxes! The bathrooms look much fresher now. My lovely mother painted them today. 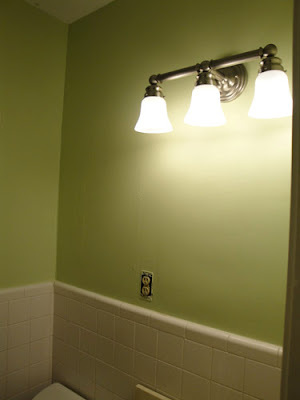 It is a little bit difficult to get the actual color, because we took the lights down in the bathroom, but they look so much better than they did! And less tacky without the ridiculous window. 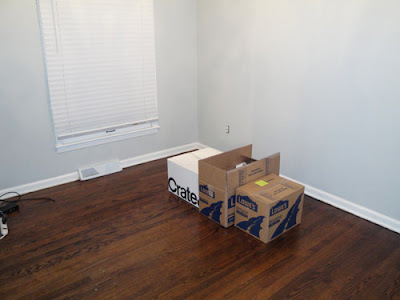 We plan to make what was originally closed storage, open shelving storage. 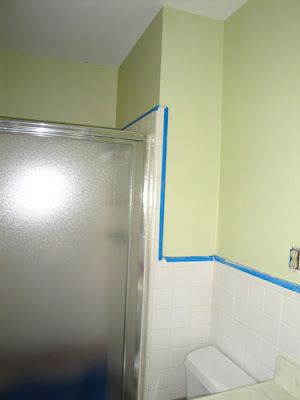 The master bath needs another coat of paint, so the blue tape is still up, but it is looking much better! Yesterday we (ok I didn't have a part in it, but I was busy with other things!) 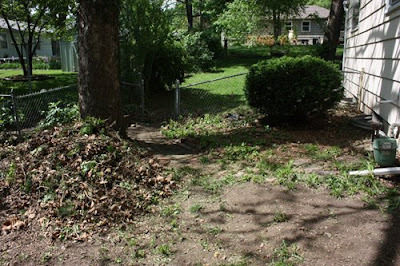 cleaned up the yard quite a bit. It looks so much better than it did. I didn't really take any before pictures of the outside, but there is still a long way to go so here are some in progress pictures. 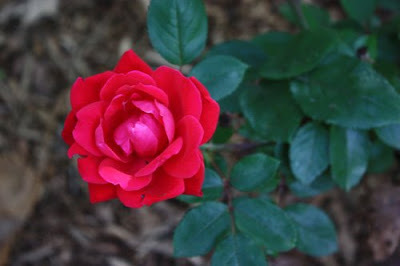 Here are a couple of the flowers that are blooming outside. I can't wait to pick out some more of my own to plant! Of course everything I see that I like my mom tells me is really hard to take care of... I'll figure it out eventually! We also got a couple more of the doorknobs installed yesterday. That project is turning out to be much more difficult than expected, but eventually we will get them all changed! ... on a thousand dollar budget. Ok well not quite that extreme, but I have definitely learned that I will probably not be getting exactly what I want in my kitchen. 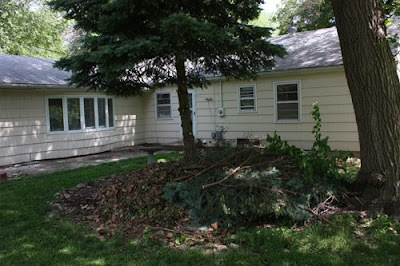 (I just have to keep repeating, this is not our forever house, this is not our forever house) After our Home Depot meeting yesterday this is what I have to think about. The current kitchen has cabinets and appliances on two walls. One wall has the stove (and the microwave when we get on and install it) and one upper and one lower cabinet, while the other wall has the fridge, dishwasher, sink, and a couple of upper and lower cabinets. When we redo the kitchen I would love to basically move all of the appliances around, putting the fridge and a pantry on the wall where the stove currently is, move the stove and microwave to the wall where the fridge currently is (and leave the dishwasher on that wall), and then add lower cabinets and move the sink to the walls where there is nothing right now. 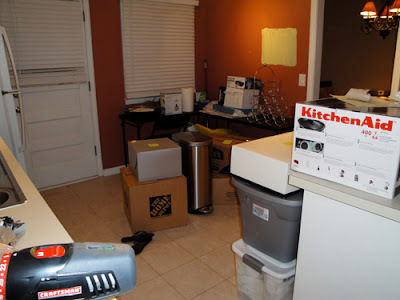 Obviously moving that stuff around increases the cost of the kitchen remodel, but I think it will also increase the functionality of the kitchen by so much. 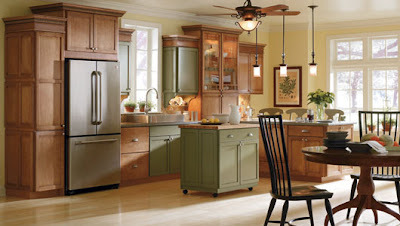 We looked at a few styles of Thomasville cabinets. 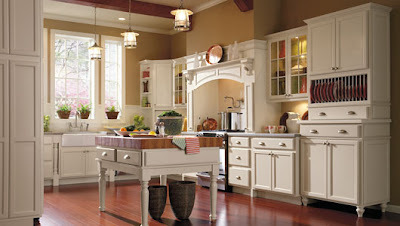 As I've previously mentioned I would like white cabinets (which also increases the price, boo). The first image shows the cabinets that I orginally picked out as the ones I like (however we would order it with the slab drawers, not the five piece drawers), but are too pricey no matter how we do the kitchen. 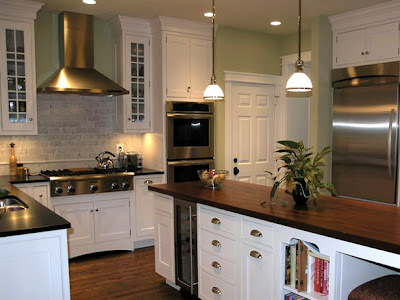 This second style could come into the kitchen if we did not move any of the appliances around and stuck with only the two walls of cabinets. It has a little extra detail on the recessed portion of the door, but it has the full overlay and slab drawers like I want. This last option shows what we might end up with, in reality no matter which kitchen layout we choose. 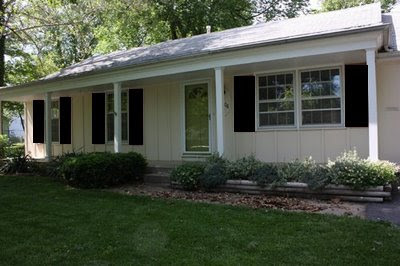 Yes they are a recessed panel like I want, but they don't have a full overlay and actually have more detail on the doors than I was hoping for. However I do still think they would look nice, and would look more modern if I wasn't seeing all of the furniture style legs. The good news is that we found out from the 21st through the 27th the granite that I want (but thought I couldn't have in my kitchen because granite was going to be too pricey) is on sale for 20% off. 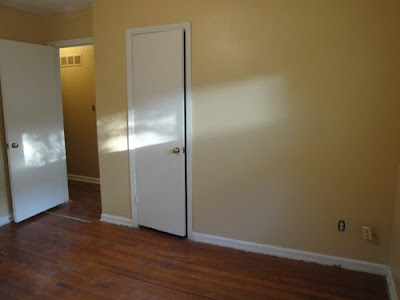 And the kitchen designer told us we could purchase some without knowing exactly what our kitchen layout will be, and as long as no one has come out to the house we can return it if we decide not to proceed with the kitchen. Sweet! 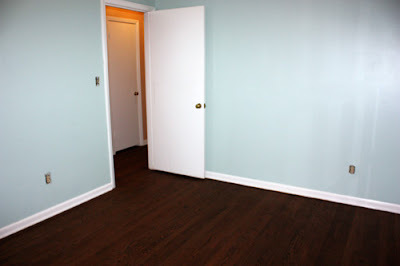 These pictures show off the floor color a little bit better. They are probably slightly out of focus because for some reason the auto focus isn't functioning on my camera, and manual focus is not my friend, but the color will be way better than the ones I took on my phone. 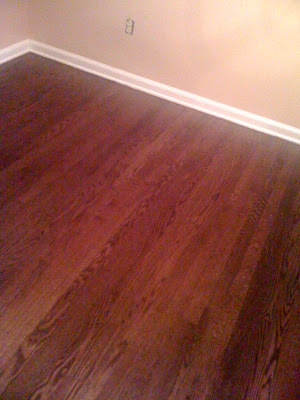 I am in love with my newly stained floors, I can't wait until they are completely done! 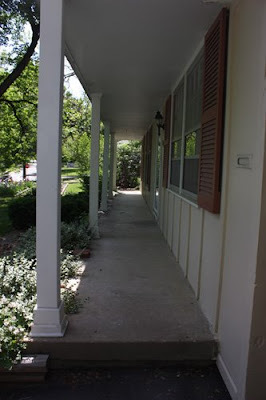 Chris and I ran by the house today in the hopes to take a sneak peek at our floors. They look awesome!! 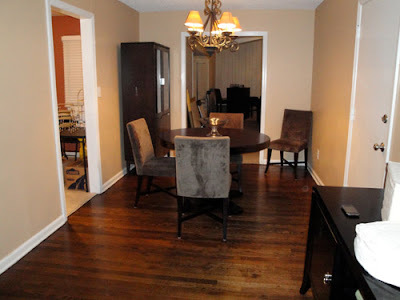 They don't have any of the sealer on yet, and they weren't quite finished with all of the floors, but they look so good. I'm so excited, I love the color we picked. Here are a couple of horrible pictures I took on my phone. 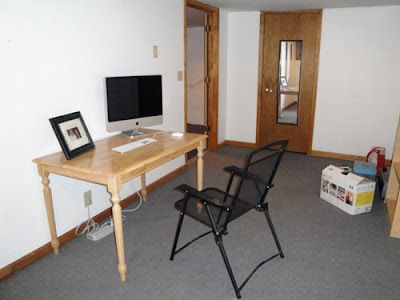 While looking for houses one of my must haves was two bathrooms. 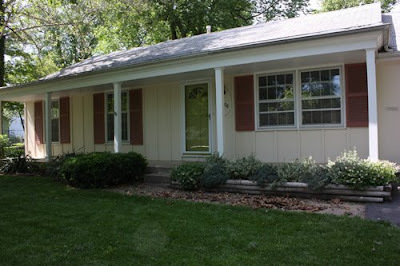 Technically this house met that criteria, it does have two baths, but the master bath is TINY!! 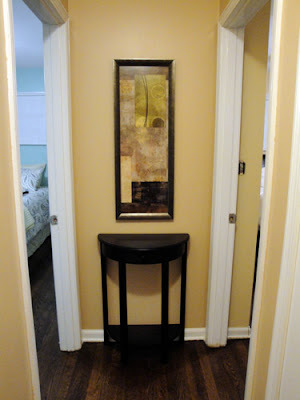 The vanity can only be 24 inches wide. The shower door doesn't open all the way because it hits the toilet, and the shower head is going to be spraying Chris straight in the face. 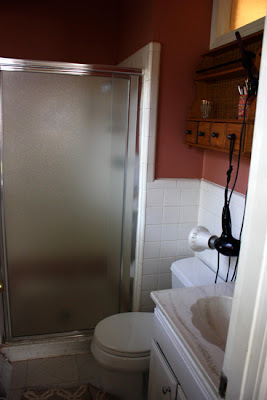 We are hoping with a few changes that this small bathroom will start to feel a little bit bigger, or if nothing else just a little bit nicer. Most likely we will take the door off the shower and exchange it for a curtain so that even if I gain five pounds I'll still fit through the little crack you have to shimmy through to get in the shower. The walls are going to be a light green. 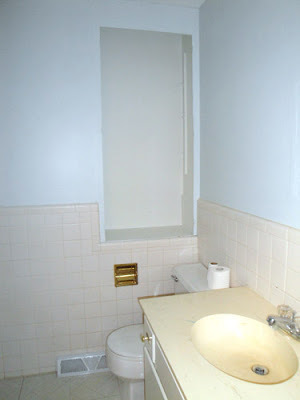 I would love to close off that awkward window like thing that lets light into the hall bath (I wonder how hard that would be...). And I think a new vanity would do wonders! 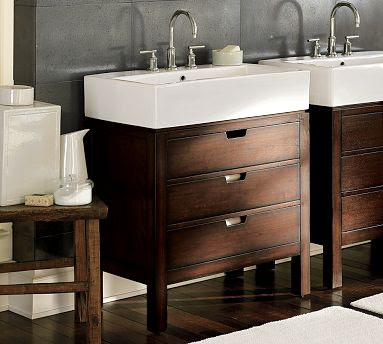 I would love either of these vanities from Pottery Barn, but unfortunately they are both larger than 24 inches wide, and oh yes, about $1500 each. That is more than I wanted to spend on the total bathroom makeover!! 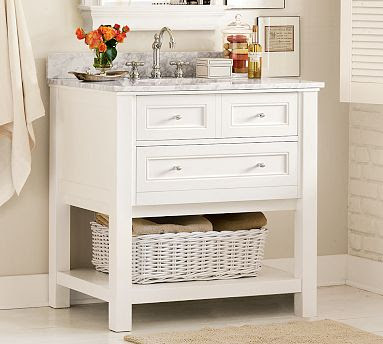 If anyone has any ideas where I can find a vanity like either of these, but smaller, and most definitely cheaper, let me know! We knew that eventually we were going to try and remodel the kitchen a little bit, because even though it (ok we thought it) was functional, everything is rather dated and could just use some TLC. But after the latest fridge discovery, combined with the fact that most fridges we want to buy simply will not fit in the space, we are pursuing redoing the kitchen sooner than planned. Well actually what I would like to take from this photo are the white cabinets that go to the ceiling, the hardware, and the stainless steel appliances. Oh and green walls. 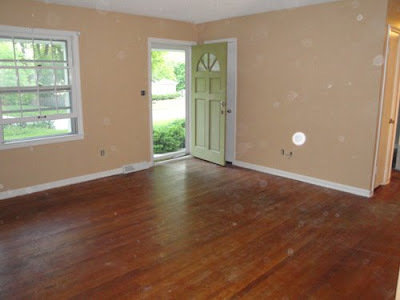 I have already the green paint for the kitchen. 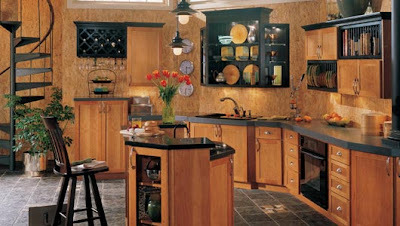 I think I would choose a lighter colored counter top, there are some at Home Depot that I really like. 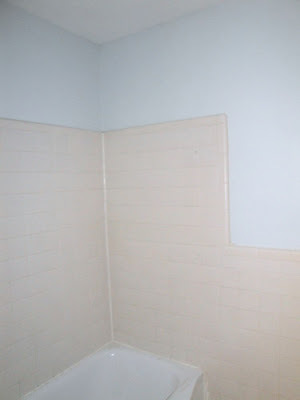 Also I would like to have a glass tile back splash, either subway tiles or mosaic tiles. I'm not quite sure what color yet. 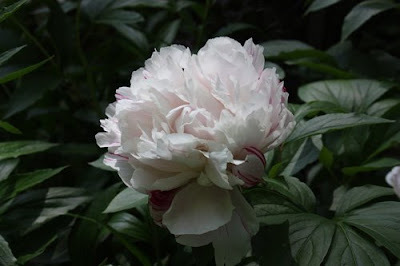 This weekend I have a meeting with the kitchen designer at Home Depot to see what they can come up with, and then sometime soon I will be getting together the guy that designed my mom's kitchen. Hopefully one of them will be able to help me create a wonderful kitchen on a modest budget! Well today was interesting... actually I'll start with yesterday. So a hole we patched in the master bedroom took a thousand years to dry, so we didn't get as much done as we had hoped. 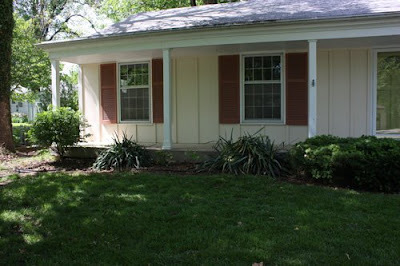 Then my dad and I started on the main portion of the house. First we planned to spray the ceiling with a paint sprayer, so we took down all the light fixtures. 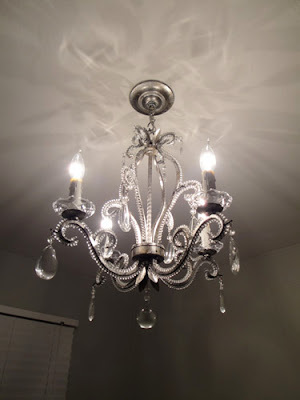 When we took down the fixture in the dining room my dad bumped a wire and it shocked him, even though the switch was off. After that the garage door and stopped working. Really? The garage door is connected to the dining room light? We flipped switches in the basement but it never started working... hopefully the electrician will call me back. A guy from the wood floor company that is starting our refinishing job tomorrow came to the house today to look at the damaged floor and give us an estimate to repair it. He walked in and said 'oh you've got some termite damage there.' What? Termite damage? 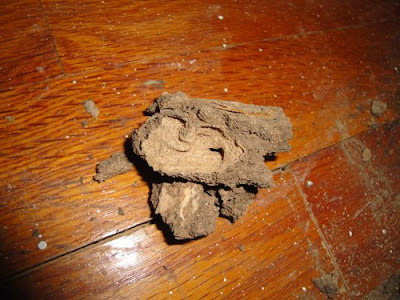 According to the man from the pest company that did our termite inspection said this house had never been treated for termites and there were no signs of any. So now we are dealing with that, having the pest company come back out to confirm whether or not it is termites, and check for any live termites. I don't know what I'll do if we have a termite problem. Overall this four day work weekend has gone well. 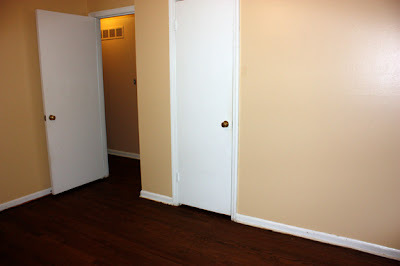 We painted every room with wood flooring including the ceiling, cleaned the fridge, cleaned the gutters and some other random odd jobs. Not too bad. 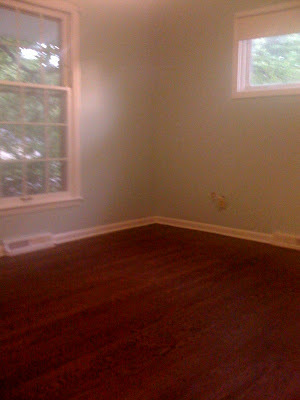 The master bedroom all painted! And my dad trying to help speed up the drying process for the spackle so we could paint the last little bit of the dining room. My parents were an amazing help this weekend. 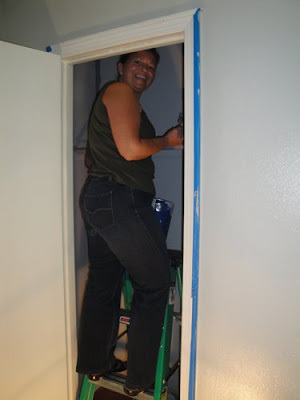 I'm pretty sure I'd have maybe two rooms painted if I hadn't received so much help from them and Meaghan and Kyle. 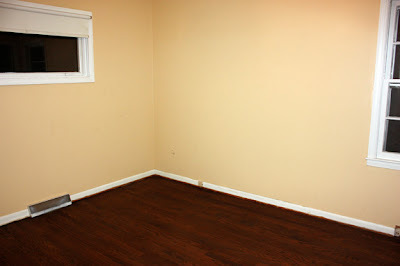 Tomorrow the wood floors are going to be sanded. Next on my to do list? Paint the bathrooms! Wow. Another very exhausting day. But very productive! 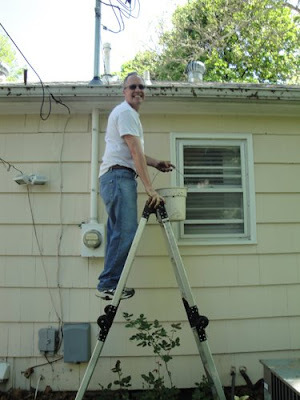 We finished patching cracks and holes, painted the rest of the ceilings in the bathrooms and bedrooms, completely painted the guest bedroom and third bedroom, put the first coat of paint on the master bedroom, cleaned the gutters, mowed the lawn, and cleaned the fridge. Not bad for one day. Oh I also got to call the plumber and have him come fix our toilet today. We actually noticed a problem yesterday but he couldn't get out to the house until today. There was water dripping in our basement and the tank wouldn't fill in the hall bath toilet. I don't know what he fixed, but it works which is all that matters to me. Talk about jumping into the ups and downs of home ownership! 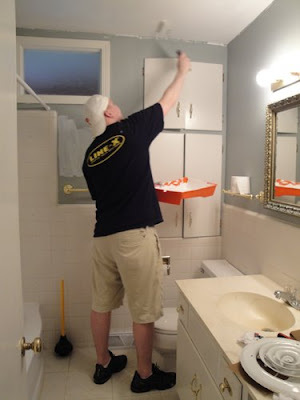 Here is the hubby fixing cracks bright and early in the morning before he had to start studying. Meaghan managed to go gray while painting the closet :). That will teach her to let her head touch wet paint! My dad is definitely a trooper for his work today. Not only did he clean all of the poo smelling junk out of the gutters, but he tackled the nasty nasty fridge. All after he mowed the lawn. Probably the best dad ever. Just try and top him! 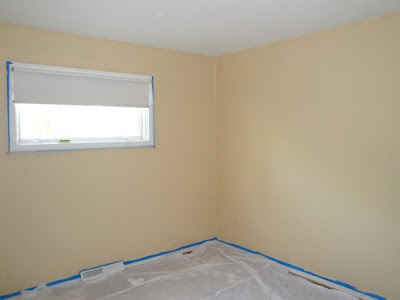 Here is the guest bedroom completely painted. So far it is my favorite. I can't wait to see it after the floors are redone. 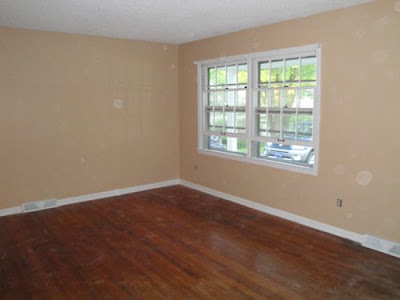 We are planning to go with a dark stain so I think the walls and trim will really pop. 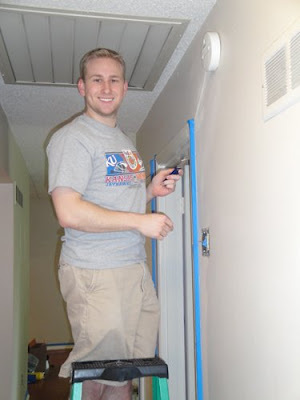 Kyle also took on several projects today, painting all of the ceilings, and doing the roller painting in pretty much every room. 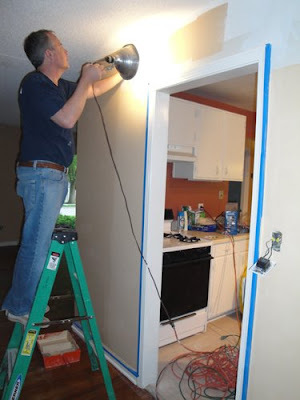 His ability to reach the ceilings without a ladder was definitely helpful! 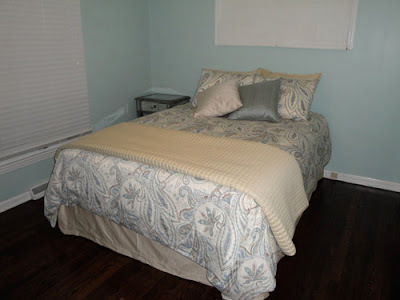 Here is the third bedroom, painted a light gray. 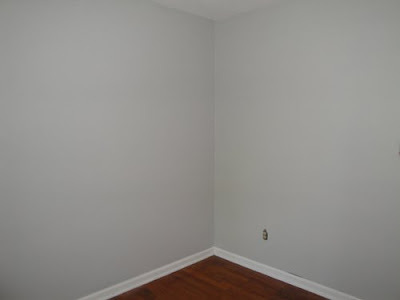 I plan to use brightly colored accents in this room, so I thought the gray would be a nice neutral. Eventually I want to stencil a pattern in a darker grey on one of the walls. I got my inspiration from here and here. 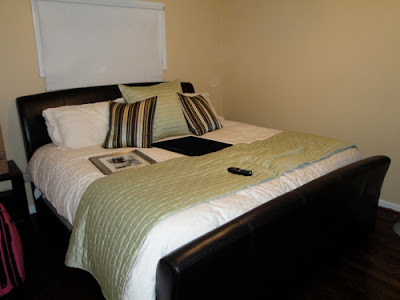 And the master bedroom. 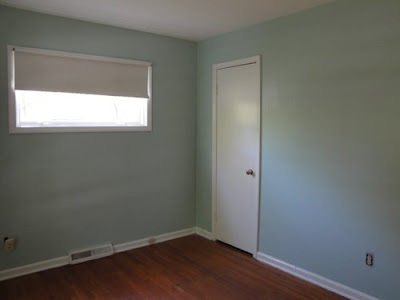 This is the room where I am most unsure about the color. It is looking more yellow than I wanted it too, (it looks even more yellow in the photos than it does in person!) 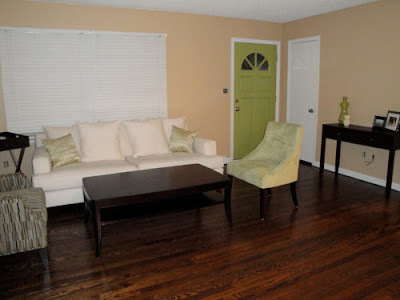 but I think when we get our furniture in the house I will like it. It wanted a light neutral, something that was slightly tan... hopefully this will work out! Still more work to do! This evening Chris and I went and purchased all new door knobs. Those definitely add up quickly, but I am excited to install them tomorrow, we are replacing some brass/gold door knobs with satin nickel. Much better!